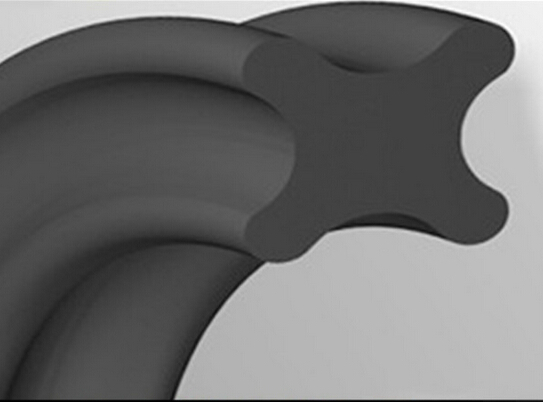 A double-acting four lip seal for static and dynamic applications. Available in a wide range of elastomer compounds. Provides higher seal efficiency and lower friction than conventional O-Rings. The walle sealing Quad-Ring Seals are four-lipped seals with a specially developed sealing profile that actually provides twice the number of sealing surfaces as an O-ring. The four-lobed design not only provides lower fiction than an O-ring, but also, due to its square cross section, it resists spiral twist. The walle sealing Quad-Ring Seals are available in a wide range of elastomeric materials for both standard and special applications. Quad-Ring Seals are vulcanized as a continuous ring. Quad-Ring Seals are supplied to the American Standard AS-568A and are completely interchangeable with O-rings in these sizes. Quad-Rings Seals are available in all standard O-Ring sizes , as well as custom seals for unique applications.